Confession. 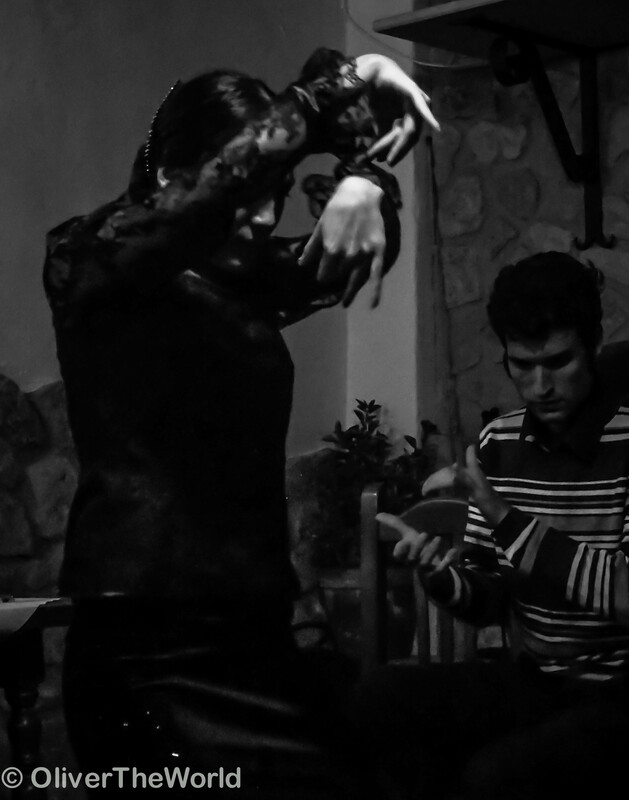 I have never been a huge fan of flamenco prior to our time spent in Andalucía. The Spanish folk performance art is and has been popular all over the world since time eternal, but it never had a handle on me like, say my obsession with Roman ruins or volcanic columnar basalt. Sure, I could rattle off some basic trivia, the kind of stuff you could just as easily lift off Wikipedia, and I knew that its calling card involved some form of tight-fitting polka dotted dress. But that was where it ended, at least for me. Contrary to popular belief, the dancer is only one of four components to flamenco, and not the most important one at that! The components are as follows: the cante (singing), the toque (the guitar), the baile (the dancing), and the palmas (the clapping). The origin of flamenco is hotly contested. There are folks in Granada who swear that it evolved out of Romani (gypsy) wedding ceremonies that took place long ago in the caves of Sacromonte, while others argue that it came from the exiled Moors and Jews who inhabited Southern Spain after the Reconquista. One thing everyone agrees upon is that it was born from the oral traditions of Andalusia’s poorest and most marginalized classes. You cannot have flamenco without compás (meter/rhythm/time signature). The dancers keep it with their feet (zapateado), the guitarists with their strumming and fingerboard tapping, the palmas with their clapping or knuckle rapping, and the singers with their various rhythmic patterns (soleás, fandangos, etc). Every city has it’s own musical style. 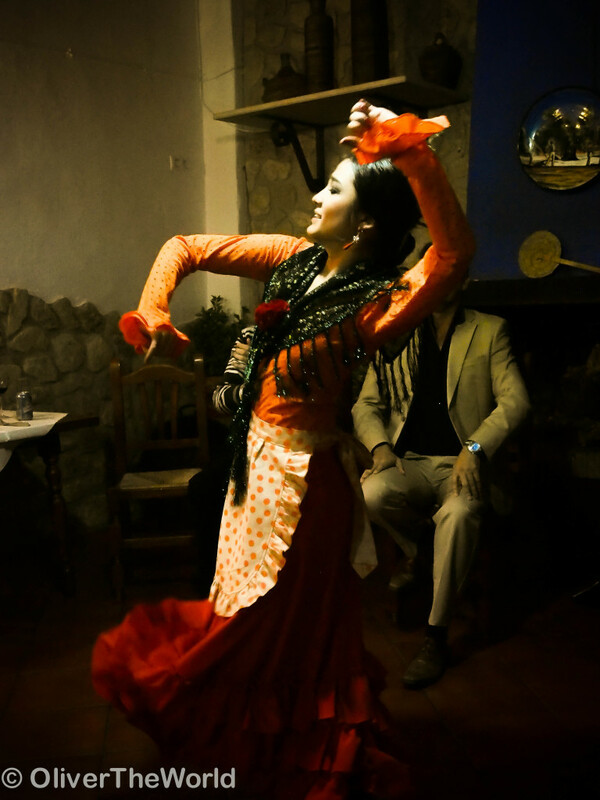 For example, Cádiz flamenco is recognized for its upbeat, lively rhythms. Oh, and if you really want to get technical, a style is called a palo. There are more than 50 of them! 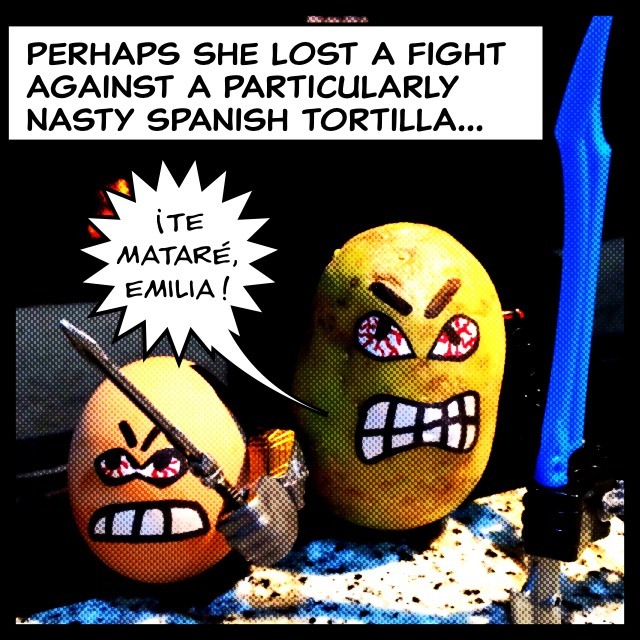 Serious flamenco purists frown on the use of castanets. Who knew? So, after shelling out more than a couple of euros for seats at ‘genuine’ flamenco tablaos in a handful of cities, can we consider ourselves connoisseurs? Certainly not. But we did see some pretty decent shows, even if they were put on for a bunch of silly tourists like ourselves (Granada’s Jardines de Zoraya , Seville’s Casa de Memoria). 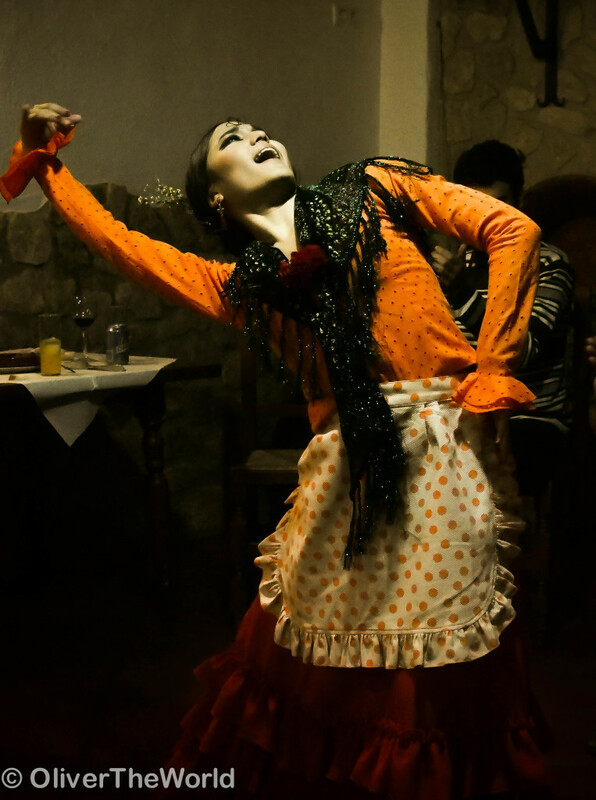 And while the flamenco was slightly amateur at Seville’s hard-to-find Carbonería, it did come at the right price (no door charge, and a few euros for some two-buck-chuck sangría). All of that changed, however, when we arrived at that little mountaintop pueblo I wrote about earlier, El Gastor. Quite unexpectedly, we found ourselves one Saturday evening over dinner neck-deep in some of the most elemental, yet gorgeously spontaneous flamenco I have ever seen; truly the very best I could have ever hoped for. And it happened to coincide with my birthday!!! The dancer was not famous, and neither were the singer nor the guitarist, but the way they all improvised together in a swirl of color and song left us speechless. The bailarina dazzled us with her versatility as she transitioned from light into dark and back again, always her elbows bent, her back arched, her fingers snapping, her face a portrait of the music in physical form. The descending melodies of the guitarrista were buoyed up by his bright falsetas (interludes). But it was the virtuoso of the cantaor, the singer, who left us with our jaws on the floor. The urgency and power in Juan Toro’s voice was wound into every note that fell from his lips, evident most particularly in his fandangos. With just a few stanzas, he dictated the energy in the room. As his voice rose, the guitarist whispered “eso es” (there it is), the dancer spun and twisted her wrists, and the palmaor helped keep time with his counter-rhythm of six claps. The musical collaboration between all four individuals was perfect as it slid, shifted and filled that room with sound and movement. 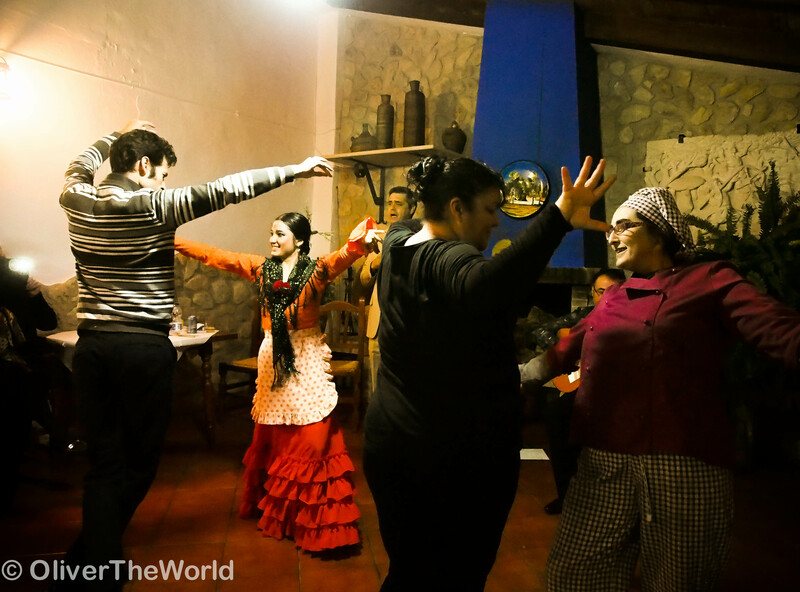 Before long, the chef and waitress sashayed out from within the kitchen and began dancing alongside the baileadora at the center of the room. 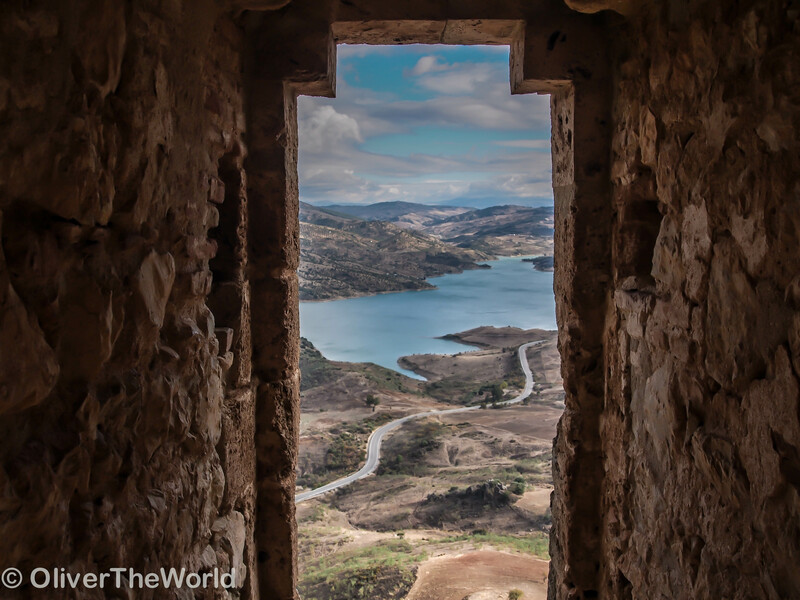 A group of gruff-looking fellows up from Ronda for the evening clapped along in perfect time, shouting “Olé!” at the end of each of the singer’s impassioned stanzas. 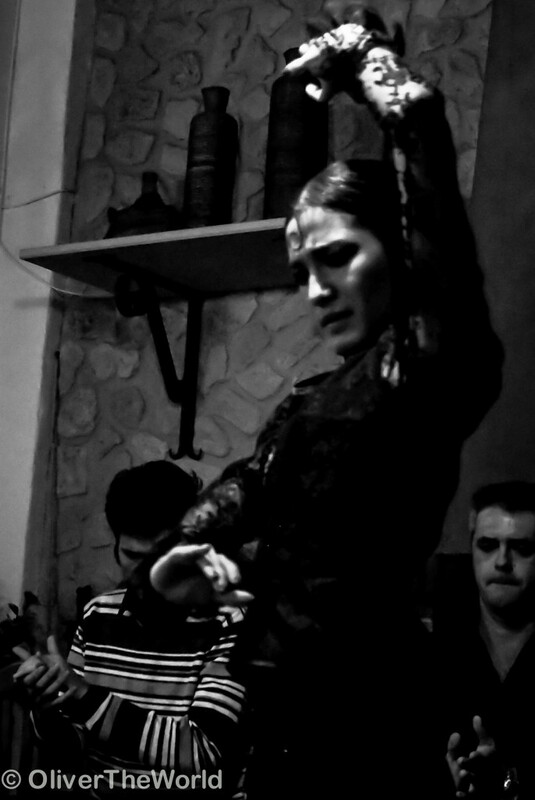 We found the flamenco at its very best when we least expected it, and that’s how I’ll always remember it.